The Kelvin Nanotechnology KNT-SThM-2an scanning thermal microscopy (SThM) probe is a monolithic, batch fabricated AFM probe for best in class temperature and thermal conductivity mapping, offering excellent flexibility with a standard low spring constant Si3N4 cantilever for easy scanning and high resolution. For quotations please use our contact form or e-mail us your order. These new SThM probes, based on the existing KNT product KNT-SThM-1an, feature a standard probe base size and a structurally compensated cantilever to give flatter cantilevers and minimise temperature induced cantilever bending. 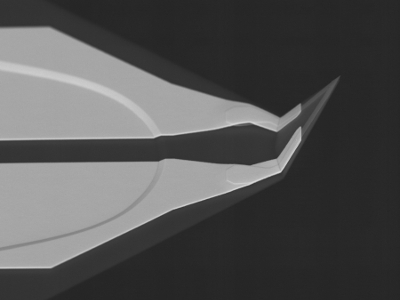 They address a fundamental limitation of soft silicon nitride SThM probes: the thermal bending of the cantilevers when approaching hot surfaces, which ultimately causes the optical feedback to fail. The probes are able to stay in contact with hotter surfaces, expanding the range of measurements and samples that can be employed.